The soft spoken Wellington Karuru was born on August 17, 1976. He is the first born in a family of 5 children and has two brothers and two sisteres. Both his brothers, Gilbert and Esau, are also sculptors. As the first born, a lot of responsibilities were shouldered upon him. He did his primary and secondary education in Mashonaland West Province and was involved in almost every sporting activity at the school. After school he was employed at National Foods LTD where he worked in the warehouse for a period of four years and was later promoted to work as sales clerk. In his free time he assisted some well known artists in sculpturing, learned alot from them and soon started develop his own talent. Inspired by such big names as Gardener Sango and Garison Muchinjili, he started to sculpt some small pieces for himself and soon found a buyer for his favorite piece titled "A cry for help". 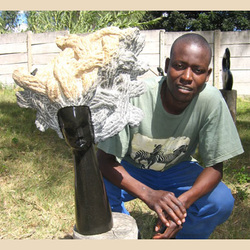 He went to work with Garison Machinjili whose influence is clearly shown in his work. Some of his pieces have been chosen already for internation exhibition and galleries, his reputation as a serious , gifted and hardworking artist is growing and even some of the greatest estabblished artists like Joe Mutasa for instance are promoting him.